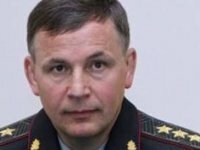 Illegal armed groups operating in eastern Ukraine have samples of Russian-made weapons that have never been in service with the Ukrainian army, which is another proof of the Russian side providing military support to militants, Ukrainian Defense Minister Valeriy Heletei has said. He said that weapons, military vehicles and personnel were sent from Russia into Ukraine every day in order to reinforce illegal armed formations. "A sign of this, in particular, is that terrorists have BTR-80A and BTR-82 fighting vehicles, which have never been in service with the Ukrainian Armed Forces and other military formations of our state. Among the weapons and explosives seized from terrorists there are also many samples of Russian weapons that are not used by the Ukrainian army. The issue concerns AK-100s, MANPADS, Shmel flamethrowers, new sniper rifles, anti-personnel mines etc," the Defense Ministry's press service quoted Heletei as saying at the House of Officers in Kyiv on Thursday at a meeting with representatives of the military and diplomatic corps accredited in Ukraine. He added that among separatist fighters who are taken prisoner there are a lot of Russian citizens who have Russian documents, are well equipped, and were trained well to be involved in subversive and terrorist activities.